Clearly angered by claims by Dar Al-Ifta head Sadek Al-Ghariani that it is involved in an arbitrary crackdown on revolutionaries from Benghazi, Tripoli’s RADA (Deterrence) forces have issued video confession of one of their prisoners which they say both proves that they are fighting terrorists and indicates links between members of the Benghazi Defence Brigades and the so-called Islamic State (IS). 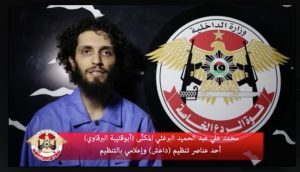 In the video, a man named as Mohamed Barghathi from Benghazi, says he had been a fighter with militia leader Wissam Ben Hamid. Last year he was wounded and sent to Tripoli for treatment. After being released from hospital, he says he stayed in the capital and became involved in kidnapping. He mentions one wealthy Benghazi man who was seized and a ransom of €4 million demanded. He was then caught be RADA and imprisoned at Mitiga. However he adds, Ben Hamid, who had himself fled Benghazi for Tripoli, used his influence to convince RADA to free him. After being released, he stayed in Tripoli but was then in contact with senior officials in IS from Sirte. They asked for details about the layout of the Mitiga prison which he provided. This, he says, was used in the IS suicide attack on the prison last September. He then tried to make his way to Sirte after the attack but was arrested in Zliten. Since then he had been held again in Mitiga. There is no independent evidence to verify the apparent confession, nor is it known if it were forced. It is likely, though, to convince many in Tripoli that RADA is dealing with real terrorists.